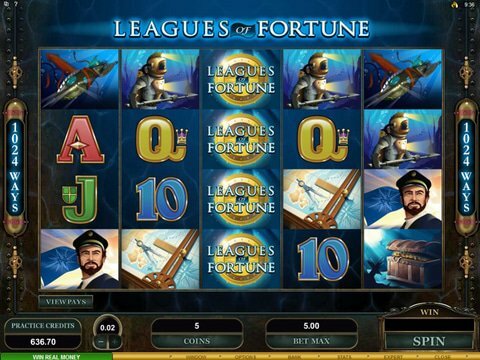 The Leagues of Fortune slot machine from Microgaming offers up a cool look at an underwater realm filled with deep sea divers across five reels and 1024 ways to win. You can try it out right here on this page with the Leagues of Fortune free play demo that is available to you with no download and no registration. Because it's also available on mobile devices, you can review it while you're on the go, too. There are plenty of different betting options here with a range from fifty cents to $10, and though the jackpot is only $750, it isn't as difficult to win as you might think. There are stacked wilds with the Title Logo that make it easier for you to win more frequently, and there are also scatters in the form of the Treasure Chest that not only pay any whenever you get two or more, but also award you as many as 35 free spins with up to a 5x multiplier. Finally, there's the Gamble option and this will allow you to stake whatever you've won during a spin for a chance to double or even quadruple it if you can guess the color or the suit of a card. Another fun underwater adventure that might be better suited toward real money gamblers is Mermaids Millions from Microgaming software. It offers you five reels and 15 paylines worth of opportunity to win as much as $37,500. The graphics are definitely dated, but there are tons of wilds and free spins that can definitely keep things interesting. The good news is that the majority of the wins are moderate in value, so you shouldn't lose too much - though it isn't likely that you'll win a fortune, either. Overall, if you like the ability to play for hours without breaking the bank, it's a good choice.